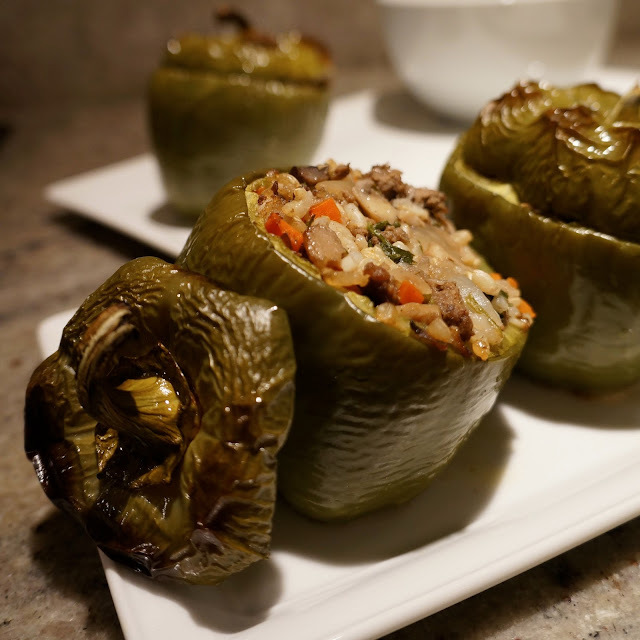 My latest quick and easy weekday dinner: this recipe is my interpretation of stuffed peppers with an Eastern flair. The stuffing is essentially a "fried rice" flavored with Chinese five spice. I prepared everything earlier in the day. Once I got home, I'd knew I'd be busy with the baby. Since everything was ready, all I had to do was preheat the oven and stick these babies in there until dinner time. preheat oven to 350 degrees F. cut tops off bell peppers and clean out seeds from center and set aside. heat oil in a medium sauce pan, saute onion and garlic until onions are translucent. add in the mushrooms, cook until most of the liquid from the mushrooms have evaporated. add in the carrots, brown rice, parsley, and five spice. stir for a few minutes, then add in the cooking wine. when the wine is almost evaporated, add in soy sauce, sugar, salt, and pepper. cook for a few more minutes or until liquid is almost evaporated. place mixture into prepared bell peppers. replace top of bell peppers and rub butter on outsides of peppers.